At what point shall we expect the approach of danger? …Shall we expect some transatlantic military giant . . . to crush us at a blow? Never! . . . I answer, if it ever reach us, it must spring up amongst us. I mean the increasing disregard for law which pervades the country; the growing disposition to substitute . . . passions, in lieu of the sober judgment of Courts; and the worse than savage mobs, for the executive ministers of justice. Political mob violence from the American Left has spiked in the past year and is now becoming nearly as common as Kim Jong-un’s threats. But, what should be even more concerning is the fact that a growing number of young, college-educated adults see nothing wrong with using violence to vent their frustrations with political or judicial outcomes, or silence speech they find offensive. Street violence and rampant vandalism followed the acquittal of a police officer in St. Louis, on September 15, who had shot and killed a suspected drug dealer during a police chase. Protesters, claiming the shooting was racially-motivated, refused to accept the jury’s verdict. For three straight nights, they rioted, breaking store windows and throwing rocks, concrete, and chemicals at police. 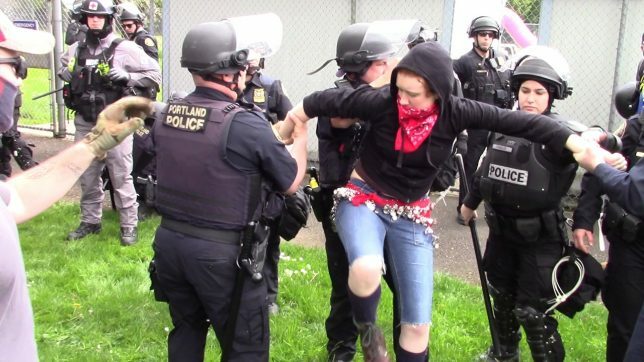 The officers arrested hundreds, including a masked individual waving an anarchist flag while he watched fellow protesters wreak havoc on local shops. The individual was armed with a handgun, a sword, and protective gear. Another individual with masks, guns, and drugs drove his car at a high speed into another motorist. 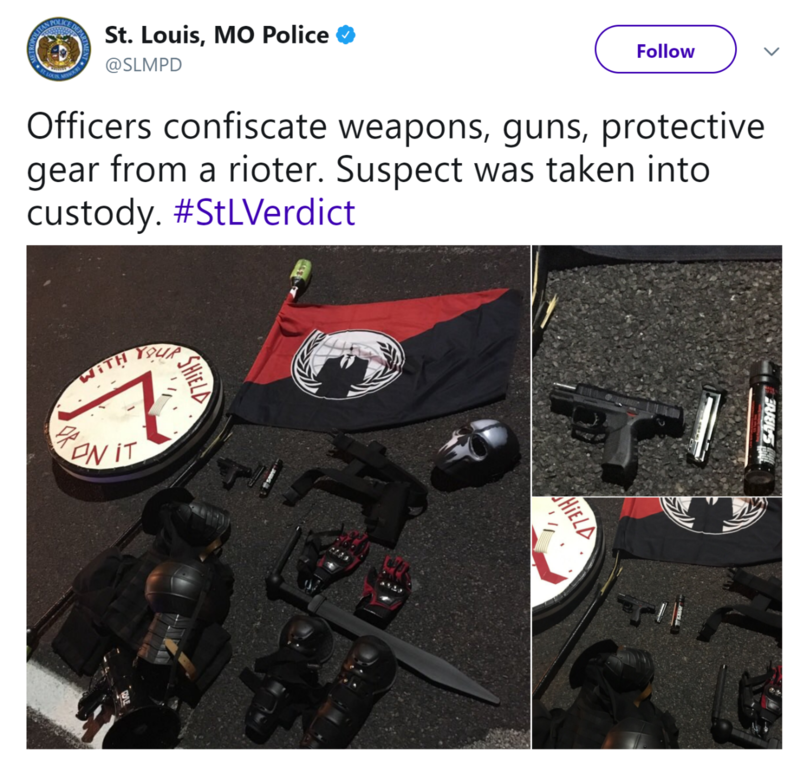 While anarchists destroyed property and attacked law enforcement in St. Louis on Monday, protesters at Georgia Tech University attacked campus police, putting two officers in the hospital and torching a police car. The Georgia Tech mob was protesting the killing of a suicidal student who had charged campus police with a knife. Shortly after President Donald Trump’s election, CRC began covering this disturbing trend on the Left to resort to violence with “America Under Siege: Civil War,” the first part in a series produced by CRC’s film wing. The film exposed through undercover footage of groups like #J20, how Leftist protesters planned to disrupt the inauguration by blockading roads and public transit to prevent people from attending. As I wrote in August about the rise of Antifa, a loosely-knit group of Leftist street thugs who violently attack anyone who disagrees with them, much of the violent reaction of the Left has arisen because seasoned liberals, who should have been more responsible, have characterized President Trump and many on the Right in general as having fascist tendencies. But, entertainers and the overwhelmingly left-leaning media don’t carry most of the blame. Many university professors, following in the tradition of Howard Zinn, have successfully convinced students that the United States is an illegitimate country with a shameful history. Many left-leaning professors are now realizing they have created an intersectional monster that even they can no longer control. The growing acceptance of violence in reaction to unfavorable speech and political and judicial outcomes poses a serious threat to the American system of government. If the country’s university system teaches future American leaders that the nation’s Founders were irremediably racist and evil, they will naturally want nothing to do with a system of government that those individuals established. The next episode in Capital Research Center’s “America Under Siege” series, “Antifa,” will premiere on September 25th at Milo Yiannopoulos’s Free Speech Week at UC Berkeley and will stream for free on our YouTube channel and at DangerousDocumentaries.com. A recent Middle Georgia State University panel on the appropriateness of Confederate monuments featured zero professors who were willing to defend such statues. The panel, called “Monument Forum: Artifacts, History, Heritage,” included three professors from various universities across the country, though not one held the position that the monuments should remain erected. “Either solution I think would make our public spaces more inclusive, and it seems to me like that’s what we should be doing,” Smith suggested, as, according to WGXA, Middle Georgia State University Professor Niels Eichhorn agreed. Notably, a recent poll found that 60 percent of the population, including a plurality of blacks, agree with keeping such monuments in place. What does Mayor Bill de Blasio think is the biggest obstacle to solving income inequality in New York City? Private property rights—the cornerstone of a free republic. Ronald Brownstein’s recent article in the Atlantic reveals that millennial, Republican pollster Kristen Soltis Anderson is losing faith in her party because of its growing nationalist wing. The cause for Anderson’s growing disillusion is real and reveals a genuine shift in the power behind the GOP. Instead of fearing and fighting the awakening giant of nationalism though, Anderson and others should embrace it in a way that doesn’t compromise their values. Anderson is a very adept young woman who managed to strike success in Washington D.C. while still in college and is part of the millennial wave of data miners — or “data dummies” as Van Jones called them, over the perception that they remain aloof from personal voter connection—who view themselves as the future of political management. She worked for eight years with the D.C.-based opinion research and communications firm The Winston Group before co-founding Echelon Insights. After Barack Obama destroyed Mitt Romney with Millennials in 2012 (which cost Romney the election), Anderson helped formulate a guideplan on what the Republican Party needed to do to capture the Millennial vote in the future. In 2015, she released a book along the same lines: The Selfie Vote: Where Millennials are Leading America (and How Republicans Can Keep Up). Anderson sees the growing ethnic diversity in America as a prime reason why the GOP must change its tactics and even modify its message. Romney won the white Millennial vote by seven percentage points but lost the overall millennial vote by 23 points. Part of the reason for this is that more than 40 percent of the Millennial population is non-white. Furthermore, most of the Millennials that voted in the 2012 election leaned liberal on social and domestic issues like immigration, marriage, federalism, and government involvement in healthcare. One key point though about the 2013 guideplan, or any political guideplan formed post-election, is voter turnout. The groups sampled were all voters in the 2012 election. Nearly half of eligible Millennial voters didn’t vote, which is not uncommon for the under-30 demographic in any presidential election. In 2016, Trump managed to galvanize millions of Americans who have either never voted or haven’t voted in years out of frustration with their options. Many of these voters were Millennials in middle America who either stayed home in 2012 or were too young to vote then. While it’s true that the millennial generation is more liberal than their parents and grandparents’ generations, much of that is circumstantial. Millennials, more than previous generations have been through a college education system that is ideologically geared toward churning out liberal foot soldiers. They also came of age during the worst recession since the Great Depression—a recession overseen by a Republican administration. Most also had greater aspirations for themselves and their country than spending trillions of dollars and thousands of lives, fighting endless wars to spread democracy. They overwhelmingly depart with the conventional, Cold War foreign policy that John McCain and Mitt Romney offered. Another factor to consider is that voters born after 1996, known as Generation Z could tend to be more conservative than millennials. Professor Jeff Brauer of Keystone College, who has studied the political habits of this up-and-coming generation believes that unlike Millennials who mostly assimilated into the Democratic Party, Gen Z-ers tend to resemble libertarians or socially moderate fiscal conservatives. Furthermore, these people have grown up on the internet and are much more likely to research an issue themselves and form their own opinion rather than take the word of a professor, politician, media pundit, or their favorite comedian. They also grew up under the unbelievably dull and economically-stagnating administration of the first minority president. So, all this millennial nonsense about white privilege kind of falls flat. Last, but not least, they’ve gotten a front row seat to the decline and fall of what was once the world’s greatest university system. Most Gen Z-ers are not too anxious to go tens of thousands of dollars in debt to hear some aging hippie rant against his or her country’s history and tout the values of socialism, without at least being guaranteed a decent-paying job upon graduation. Anderson wonders “whether Donald Trump’s GOP has a place for people like her, who want a party that marries support for less government and robust national defense with a commitment to racial and social inclusion.” The problem though is that there aren’t enough Americans that want that policy combination to win a presidential election. That was proven in 2008 and 2012. Anderson and her fellow “moderates” got the candidates they wanted in John McCain and Mitt Romney and Obama drubbed them both. When one side gets its teeth kicked in twice in a row, it usually helps to find reinforcements the next time around–which is exactly what Trump did in 2016. He tapped into the silent, frustrated American majority that cares a lot more about rising healthcare premiums and economic opportunity for American citizens than statements or shows of racial and social inclusion. The overwhelming majority of voters on the right wanted a president who was going to put the country first at home and abroad, uphold the rule of law (i.e. crack down on border security and deport illegal immigrants), and stop trying to turn the U.S. into a social experiment. Most people who want the government to make a big deal about racial and social inclusion also want a government that will commit to providing free college tuition, debt forgiveness, and free healthcare for all. The coalition that Anderson wants simply doesn’t exist. According to Brownstein, she doesn’t want to join the Democrats but is open to a potential third party with the Republican policies in the mold of Massachusetts Governor Charlie Baker and UN Ambassador Nikki Haley. In 2016, the U.S. got the third way it had been craving for a long time. Trump is hardly a conservative. For many years, he supported Democrats. He is the most fiscally liberal Republican president since Theodore Roosevelt and he trounced Hillary Clinton with Independents. He was practically an independent that took over the Republican Party. Anderson is disappointed that only one-in-four Republicans disagree with Trump’s response to Charlottesville. The shocker should be that a quarter of Republicans bought the media lie that Trump made a moral equivalence between fascists and anti-fascists. He didn’t. He made a moral equivalency in the violence perpetrated by both sides, which as dozens of videos on YouTube show, the leftist protesters started. Mankind is nationalistic by nature. The growing nationalism of Americans that found a voice in Donald Trump is not old or dying out—it’s growing stronger. The Democratic Party has already picked the politics of tribalism over Americanism and the Republican Party won’t win any brownie points from voters if it tries to keep playing sidekick to the DNC’s ideals. People on the right aren’t going to support a party that just wants to lower the top income tax rate from 39 to 35 percent and pour another billion dollars into a bloated military. If it weren’t for the appeal of nationalism, Hillary Clinton would be president and the Republicans would be in the minority in Congress. If for no other reason that shows that nationalism is the future of the GOP. Most of the people fueling the outrage at the hundreds of Confederate memorials throughout the United States since the Charlottesville riot would just as soon pull down the monument of a Union general, or even a Founder of the nation. The issue at hand is not the right of state secession (an issue most of the historically illiterate anarchists have never studied), but whether the U.S. is legitimate nation. President Donald Trump caught a firestorm of criticism from the media for condemning the violence that the white nationalists and the Left-wing counter-protesters engaged in because the media was incapable of understanding that he was creating a moral equivalency of their acts of violence, not their beliefs. It didn’t take long for the social justice warriors to take their hate and vitriol out on stone and marble structures, infamously pulling down a statue in Durham, North Carolina, resulting in numerous felony charges. Dozens of anti-Confederate protests on campuses and in cities across the nation have erupted since, and in Baltimore and Austin, authorities had Confederate monuments relocated under the cover of darkness. So, they were, your basic boring Reds who didn’t get the memo that world socialism is so 20th century. It didn’t take the cultural Marxists long to answer that question. Since the Charlottesville street fights, the monuments and memories of Christopher Columbus, Thomas Jefferson, and even the Great Emancipator himself Abraham Lincoln have come under attack. New York Mayor Bill de Blasio is even appointing a special committee to look at the monument issue. One of the things that committee will consider is whether to dig up and relocate poor Union General Ulysses S. Grant, who also happened to be Lee’s nemesis over an anti-Semitic order that Grant gave once while under Lincoln’s command. The fact is, those protesting the Confederate monuments have no love for the Union. They view the U.S. as an inherently racist and white supremacist nation the way Hilary Clinton described Trump’s “basket of deplorables:” irredeemable. Although history isn’t exactly their strong point, they understand that the views of the Confederates was not that different from those of the Union. They were all people of their age and their views on practically anything (including ethnicity) would have likely been more similar to foreigners of their time than to Americans in the 21st century. The Charlottesville violence is simply an open window for these cultural revolutionaries. Their financial backers want an economic, socialist revolution and just like Antonio Gramsci, they understand the best way to bring that about is to facilitate a cultural revolution. It’s much easier to get people to support the overthrow a system of government if you can convince them to hate the people who instituted that government.